Cracked Teeth · Brian Amoroso, D.D.S. Are you worried that you suffer from a cracked tooth? 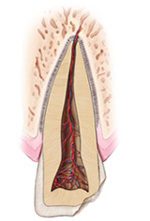 Do you know that root canal treatment could save your cracked tooth? Before your symptoms worsen, visit Dr. Amoroso to see if your tooth can be saved. Dr. Amoroso is a specialist at diagnosing your symptoms and saving your teeth. Our smiles are built to last. In fact, tooth enamel — the outer surface of our teeth — is the hardest substance in the human body, stronger even than our bones. That tooth enamel can withstand a lot of wear and tear. But as we live longer, and expose our teeth to stresses like clenching, grinding or chewing on hard objects, we can put our smiles at risk. If you think you have a cracked tooth, it’s important to seek treatment quickly, before the problem gets worse. 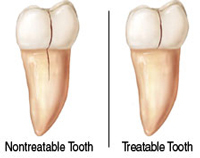 A cracked tooth means a crack extends from the chewing surface of your tooth vertically toward the root. The tooth is not yet separated into pieces, though the crack may gradually spread. Early diagnosis is important in order to save the tooth. 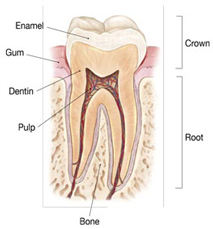 If the crack has extended into the pulp, the tooth can be treated with a root canal treatment. The treatment you receive for your cracked tooth is important because it will relieve pain and reduce the likelihood that the crack will worsen. Once treated, most cracked teeth continue to function and provide years of comfortable chewing. Talk to Dr. Amoroso about your particular diagnosis and treatment recommendations.